It's the juggling and the madness that happens around dinner time during the spring season that makes me so crazy. Baseball practice, soccer games, field hockey clinics and dance, dance, dance, everyday, at different times each day....aaargh! I cannot keep track. Especially when there really is no schedule and the "organizers" expect you to fly by the seat of your pants! If I am kept from setting up the day at least 24 hours in advance, it makes me want to poke out my own eye. But that's my problem. Which brings me to another pet peeve: creating a meal that can be eaten in shifts. Is it really to much to ask for a delicious meal at the end of the day instead of boiling up plain pasta or throwing a hotdog in a pan? Don't get me wrong, there are times when the schedule dictates such fare and I willingly put those items on my grocery list for such occasions. But I refuse to eat that stuff all week long while being held hostage by my children's activities schedule. Maybe kids and most men are able to subsist on such bland choices, but I demand something a bit more tempting at the end of a long day and the start of a potentially longer evening. Of course, there is always that old standby, the crockpot. But I find it difficult to find the time in the morning for the preparing, chopping, searing, etc. in advance which I feel must be done to insure a tasty result. I am able, however, to marinate a piece of meat as long as there are minimal ingredients involved. Ziploc bags are a lifesaver in this instance. I don't even use a measuring cup, I just dump it all in and throw in some sort of meat. And if there is an easy, uncooked fruit/vegetable option that takes minimal time and fuss, we are all better for it and it will take care of the obligatory "healthy" portion of food I push on my kids at dinner time. Because it is a challenge to jazz up frozen corn and peas on a daily basis. 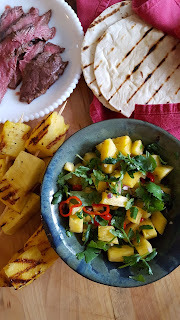 I came up with the following recipe as fresh pineapples are on sale this week along with petit sirloin. Most of what I plan is based on the supermarket circular. I love a good bargain. Substitute chicken or pork, if you want. If the steak, is to large for cooking it to order, cut it up to suit your needs. 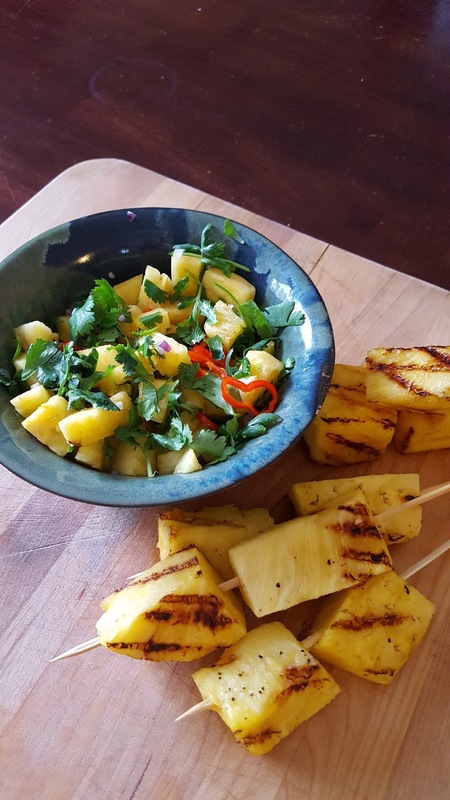 The pineapple salsa can be made in advance or while you are grilling the meat. *Feta cheese makes a great addition added to the salsa or just for topping the taco! *Sprinkle large chunks of pineapple with sea salt and grill them along with the steaks. *If you have very hungry eaters, a pot of white rice goes well with this meal. Place all ingredients in a Ziploc bag and place in refrigerator until ready to use. Marinate steaks 6-24 hours. 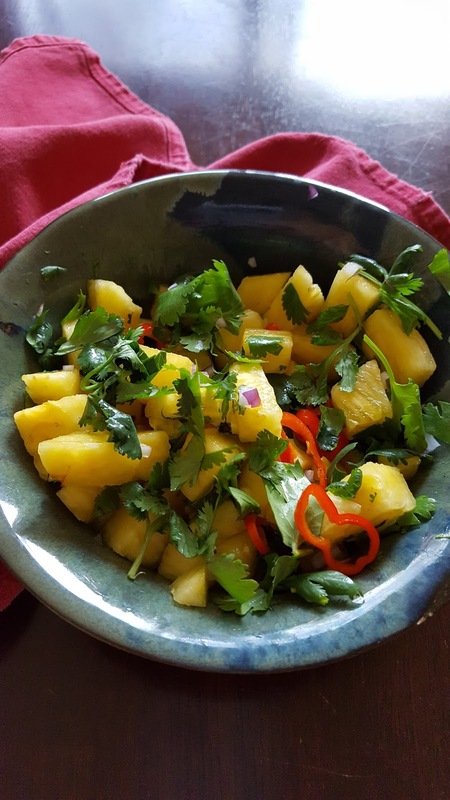 Combine pineapple through lime juice in a small bowl and allow flavors to meld. Can be made up to 12 hours in advance. Cover and keep chilled until ready to use. About 30 minutes before cooking, take the steak out of the refrigerator and pat dry with paper towel. Sprinkle with salt and pepper. To cook the steak, heat a cast iron pan or grill on high. Once heated, place the steak on the pan or grill and cook for at least 3-4 minutes per side depending on how thick the steak is. Press down on the steak, if it still feels squishy, cover it and allow it to cook for 2 minutes more. If it begins to feel firm, remove it to a plate and let it rest for at least 5 minutes before slicing. Meanwhile, while the steak is resting, toast tortillas in pan or on grill. Wrap them in a tea towel until ready to serve with pineapple salsa and grilled pineapple. Anna, Thanks for your comment. I hope you enjoy the tacos!